"A powerful story of 9 strange people"
From the town of Tonto in New Mexico a few people go on a stagecoach. Doc Boone, a drunkard, who was kicked out of the guild of doctors. Dallas, a prostitute whose sexual adventures so angered the local women that they threw her out of their society. Hatfield, sharpie, pretending to be a gentleman, a southerner who has his own reasons to leave the Tonto. He, nevertheless, pretends that he volunteered to accompany a pregnant Lucy to her husband, cavalryman. Henry Gatewood, pompous banker sits in the stagecoach with a small traveling bag, which he did not let go. There are some other people in the wagon, too Stagecoach started, get ready for adventure! 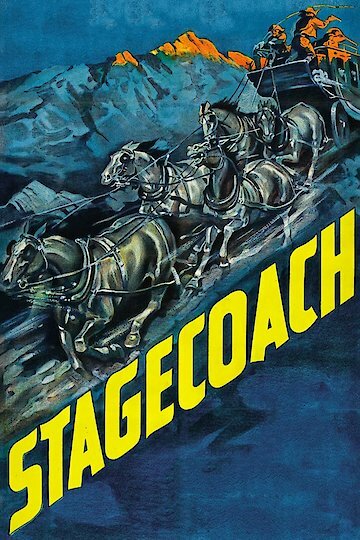 Stagecoach is currently available to watch free on The Roku Channel and stream, download, buy on demand at Amazon Prime, FlixFling, FlixFling VOD, Amazon, Vudu, iTunes online.